Designed specially for children. Retains all the functionality of the adult model. 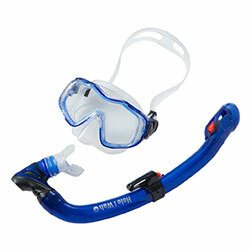 With its wide field of view, even children who are novice snorkelers will enjoy the experience. ■ Compact fin Aulii+ Jr.
A compact snorkeling fin constructed using multiple materials in a hybrid blade that combines good design and exceptional functionality. This premium snorkeling fin featuring an exquisite balance of propulsive force and portability gives you a comfortable snorkeling experience.